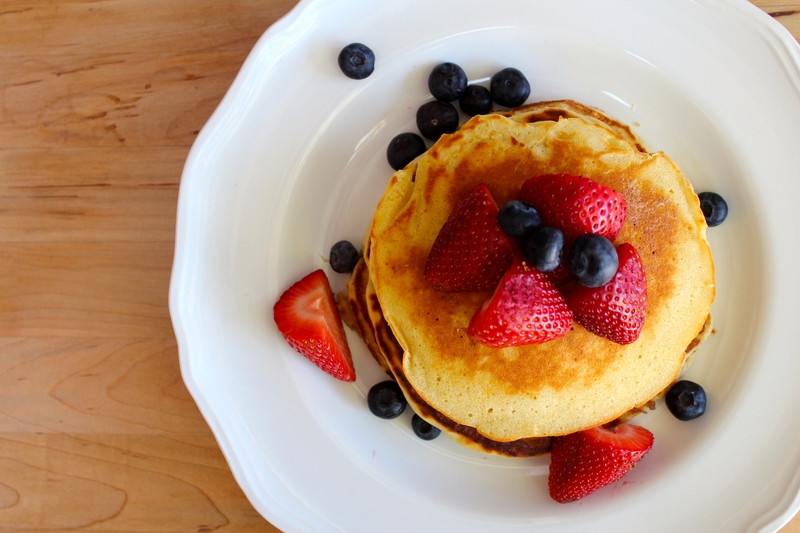 Happiness Project#56: Lemon Berry Pancakes! Dear Breakfast, I heart you! With all of your fruits and granolas and yogurts. But your Lemon Pancakes? You slay me. Slay. Me. If you know anything at all about my sweet tooth, then you must know of my endless, obsessive love for lemons. And strawberries. Chocolate, too, but that’s a far different story. So this new Lemon Pancake recipe is long, long overdue. Says nearly all of my family. Who happen to LOVE lemony desserts just as fanatically as I do. If not more so. Truth. Anyhow, to make a long story short, because of my Daughter, and being a “up-at-7am-everyday-now” Mama, breakfast, with my mandatory cup of Mocha coffee, is now an everyday special kind of event. Which I (surprisingly) actually enjoy. I know. Go figure. And while my Toddler will snack on just about anything I make, my menopause diet demands otherwise. So pancakes, especially THESE pancakes, are an every-once-in-a-while treat for me. Though to be completely honest, I DO try to rationalize away any of those self-splurging doubts by helping myself to a ginormous topping of strawberries and blueberries. Because fruit IS healthy, after all. Right? Right. And just so you know, once you treat yourself to these lemony fluffy yum-yums, you will never go back to a regular buttermilk pancake ever again. Trust me. To begin, zest the whole lemon. Collect the lemon zest and set aside. In bowl #1, combine the milk, vinegar and lemon juice. Let stand for 5 minutes before whisking in the egg, melted butter and vanilla extract. Set aside. In bowl #2, whisk together the flour, sugar, baking powder, baking soda, salt and lemon zest. Slowly pour in the milk mixture (bowl #1) into the flour mixture (bowl #2) and stir until fully combined and lump free. Yeah, these pancakes truly are THAT easy! And just WAIT until you taste them! With or without a large topping of syrup and fruit. Though, strawberries, my friends. Strawberries. Happy Mornings to you and yours, my friends! « Happiness Project:#55: Happy Heart Cookies! YUM!!!! Will you come to my house and make me some? Pinned these they look so good! Way to make use of being up so early! !